There is some very lovely running in downtown Rochester, particularly in the ‘East End’ area, referred to as ‘Neighborhood of the Arts’ around University Ave. Run by the Strong Museum, George Eastman Museum, the Science Center, and other spots. This is a pretty area with a nice canopy, featuring a mix of key Rochester sites, shops, and high-end residential side streets. Rather than map out a specific route, our recommendation is to create your own run in the area between University Ave. to the north and I-490, between Alexander and Culver. Run along the main avenues such as Park Ave., East Ave., and University Ave., each 1.0-1.5 miles in this area. 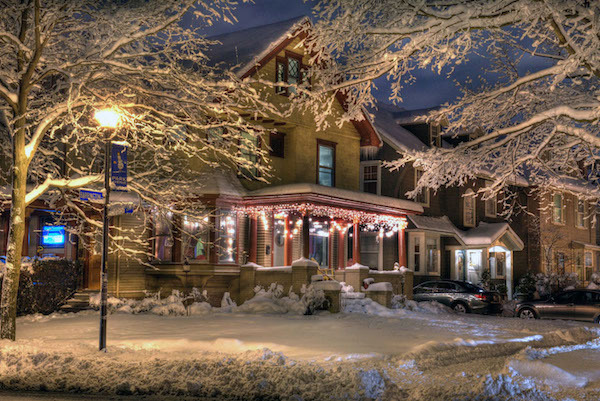 Then, enjoy the lovely residential side streets south of East Ave. and west of Culver, Granger Place, East Boulevard, Douglas Road, Westminster Road, and Berkeley Street, and Oxford St. We also enjoy the Victorian homes in the Corn Hill neighborhood, on the west side of the Genesee River, between Ford St. & Exchang Blvd. The streets in this area are well-lit and have good sidewalks. They’re also a good alternative in winter, when some of the paths & trails might not have been cleared.